Title sponsor and official tyre supplier, Dunlop, have reviewed the weekend’s action and what an exciting one it was… with tyre choices and the ever-changing conditions at the centre of the action at Brands Hatch. Mike Bushell’s return to the series was marked with an impressive fifth place finish in the final race, which also secured him Dunlop’s #FOREVERFORWARD spoils for making the most passes during the day. Further down the grid, Jackson, Butcher and Sutton would all gain 11 places. The latter with a valiant charge in the dying laps to gain valuable points. That left Senna Proctor to claim his maiden BTCC win (on soft tyres), Hill to take his first BTCC podium (on prime tyres) and Jackson to also claim his first podium (on soft tyres). The opening round of the Dunlop MSA British Touring Car Championship at Brands Hatch on Sunday will go down in the record books as one of the most thrilling and entertaining events in the series’ 60-year history. Tyre choice was to play a major role; Dunlop’s BTCC SportMaxx Prime and Option tyres, and the BluResponse ‘Wet’ all contributed to the staggering amount of moves in Dunlop’s ForeverForward table. Top movers in the day’s wet opening race, which saw the entire field use the new blue side-walled BluResponse tyre, were Ollie Jackson, Rory Butcher and reigning BTCC champion Ash Sutton, who all gained 11 places from their start position. But it was the second race of the day that really shook up the order and produced a real edge-of-the-seat cliff-hanger. A drying track had many drivers pondering whether to switch from wet to dry tyres, with subsequently nine drivers taking the gamble at start, and Colin Turkington and Mike Bushell switching later in the race. Over the opening lap Tom Ingram led Jack Goff and Andrew Jordan, all making the best use of their wet tyres to grab the immediate advantage on the wet track, as the slick runners fell back. However, as track conditions improved, and a dry line formed, the slick runners were quickly lapping around four seconds a lap faster and the deficit was instantly overturned. Within one lap the lead trio had changed as Aidan Moffat, Senna Proctor and Jake Hill capitalised on the Dunlop slick’s grip to surge ahead. On lap 26 Proctor came off best from brief contact with Moffat, and went on to record his maiden BTCC victory, utilising the SportMaxx Soft option tyre, and gaining a staggering 26 places in the process. Jake Hill clawed his way through from 25th to finish second on the prime tyre, with Jackson also on the soft option tyre, third for his first podium finish. Other top movers across race two were Mike Bushell (24 places) and Rob Austin (23). 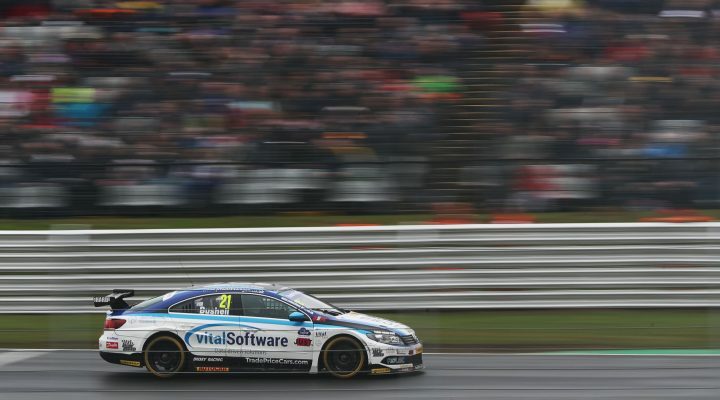 With 24 drivers not running their soft tyre allocation in races one or two, under the BTCC tyre rules, they were required to use them in race three in dry conditions, with eight on the prime tyre. ForeverForward honours were claimed by a recovering Colin Turkington, who charged from 27th to ninth on the prime tyre, closely followed by Matt Neal who came through from 29th to 12th on the option tyre. Ingram was on form on the option tyre, charging from 11th to 1st to take his first victory of the season, his overtake on Austin on lap 13 subsequently voted the fan’s favourite. Other notable performances came from Adam Morgan and Tom Oliphant both on the Soft option tyre who gained 11 places each.